Storage Case Turns into a 4 Channel Remote Control! 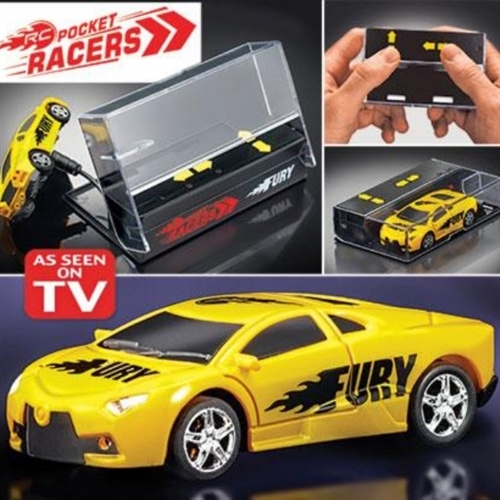 The super fast RC cars are small enough to fit in your hand, lightening fast with razor sharp handling. The ultra bright LED lights make them even more fun! Race like a pro with RC Pocket Racers! 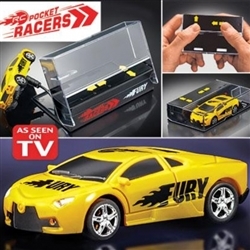 Your kids will love racing these super fast micro RC car hot rods. The ultra-bright LED headlights make racing in the dark even more exciting! These wickedly fun Pocket Racers fit in your hand. The storage case charges the car in just minutes, then transforms into a four channel remote control- 4 friends can play at the same time! The mind blowing speed and razor sharp handling make these the best RC racers! Each car measures 3" L x 1.25" W. Requires 2 AAA batteries (not included).